STEM: Gerald Luverne Tordoff, 77, died Tuesday, November 27, 2018. The son of the late Ward Tordoff and Betty Bartels Tordoff. In addition to his parents, Mr. Tordoff was preceded in death by his son, Rusty Tordoff. 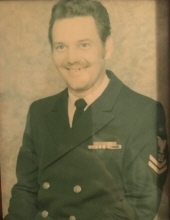 Mr. Tordoff served in the US Navy during Vietnam. He retired from the US Navy after serving for 20 years. He was a member of the VFW and the American Legion. He enjoyed spending time with other Veterans and reading about military history. Mr. Tordoff enjoyed woodworking and he played a mean game of dominos. Mr. Tordoff is survived by his wife of 52 years, Peggy Tordoff; daughters, Sabrina Fox, Kathy Kelly, Kelly Curtis, and Sharon Roberts; sisters, Sheila Andrews and Brenda Norbrega; nine grandchildren, Cindy Tordoff, John Russell Tordoff, Nicholas Tordoff, Timothy Tordoff, Praise Tordoff, Michael Tordoff, Emily Tordoff, Christopher Tordoff, and Kaela Curtis; and three great grandchildren, Rylie Rutherford, Jackson Rutherford and Kaila Velasco. A graveside service will be held at 2 p.m. on Friday, April 5, 2019 at Beaufort National Cemetery: 1601 Boundary St., Beaufort, SC 29902. In lieu of flowers, donations may be made to the American Cancer Society by mail to Conquer Cancer Foundation PO Box 896076 Charlotte, NC 28289-6076. To send flowers or a remembrance gift to the family of Gerald Luverne Tordoff, please visit our Tribute Store. "Email Address" would like to share the life celebration of Gerald Luverne Tordoff. Click on the "link" to go to share a favorite memory or leave a condolence message for the family.